Cabbage Sambharo is a quick cabbage stir fried salad. Cabbage Sambharo is super easy to make. 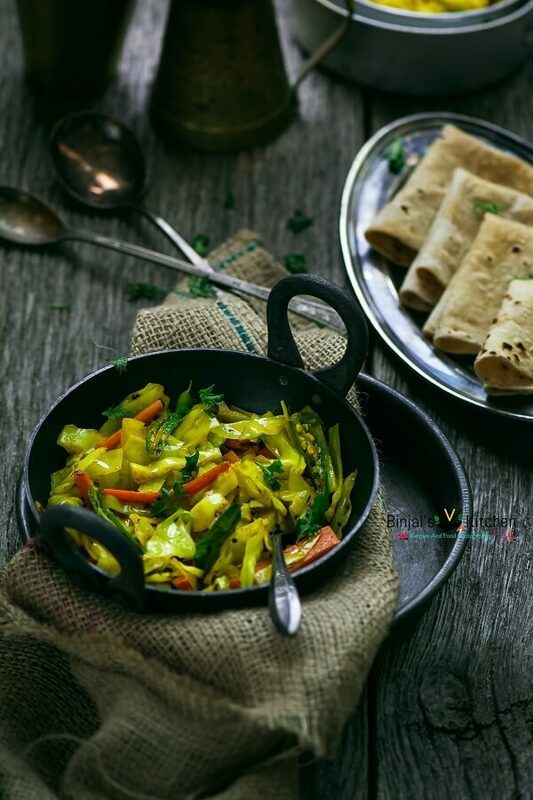 Cabbage Sambharo is served as a side dish along with Gujarati main course called as a Kobi No Sambharo, also this salad mostly served with snack items like gathiya, papdi and fafada and make perfect combination with them. Cabbage Sambharo is my one of the favorite breakfast items with gathiya in India. Cabbage sambharo is a Guajarati healthy stir fry sweet and sour salad. Kobi means Cabbage and Sambharo is a stir fry made from grated veggies sautéed with chilies in oil, mustard seeds and turmeric. Though the method of preparation is somewhat similar to making sabji, this is actually the recipe of a salad. Hence, make sure that cabbage remains crunchy when you stir fry quickly on hot flame. 1. Heat oil in a pan, once oil is hot enough, add mustard seeds and cumin seeds and allow it to pop ups. 2. Once seeds start popping up, add pinch of hing, then add chopped green chilies and curry leaves and stir fry it for few seconds. 3. Now add chopped cabbage, sliced carrot, turmeric power, sugar and salt. 4. Mix mixture using a spatula and stir fry it continuously on high flame on 2-3 minutes till spiced aromatic, you can feel the spicy smell. 5. Cabbage Sambharo is ready. You can remove it from the flame and add lemon juice, chopped coriander leaves and serve with your main course or chips or snack and enjoy the crunchy warm salad. • You can also add raw shredded papaya into the salad while cooking. • you can skip coriander leaves if you don’t like it, it optional. Heat oil in a pan, once oil is hot enough, add mustard seeds and cumin seeds and allow it to pop ups. Once seeds start popping up, add pinch of hing, then add chopped green chilies and curry leaves and stir fry it for few seconds. Now add chopped cabbage, sliced carrot, turmeric power, sugar and salt. Mix mixture using a spatula and stir fry it continuously on high flame on 2-3 minutes till spiced aromatic, you can feel the spicy smell. Cabbage Sambharo is ready. You can remove it from the flame and add lemon juice, chopped coriander leaves and serve with your main course or chips or snack and enjoy the crunchy warm salad. Been looking for this recipe for a while…didn’t know what it was called. Thanks!